Why is Patrick Beach the best at what he does? I am more than excited to tell you that I recently attended a workshop in Orlando with the Instagram sensation, Patrick Beach. I was more than excited to learn directly from someone I consider as one of the best at what he does, and here is why. I’ve been following Patrick and Carling, his girlfriend, for over a year now. They pretty much have been traveling for over 3 years giving yoga workshops all over the world. I did not know what to expect but I saw on Instagram his classes were always full. I was very curious to learn more about him. I also found out more about him through his great YouTube channel where he has tons of material to practice at home and more. By the time of the workshop, I made sure to make a significant effort to strengthen my core to prepare for his classes. The workshop is divided between three sessions over the weekend, starting Friday night with one of the hardest classes I’ve ever taken, in terms of physical challenge. The postures he teaches are unlike something you probably have never done or heard of, he really makes you discover new muscles and how to be aware of all of the things you are feeling in every part of your body. 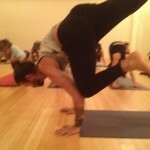 In fact, he emphasizes how important is to learn to be aware of your body completely. He also goes to explain that doing inversions of any kind, is like learning how to walk when you were one year old. Before we ever took our first step, we were crawling around, trying to build strength through our arms, legs, back, etc. It’s the same with inversions, we need to crawl before we walk, so a lot of core strength exercises, every day practice and commitment. The Second session were working shoulders, twist, bindings and more core strength with a good anatomy sessions. 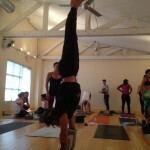 The third session was getting to do handstand, even if you have never done one before. It was a very dynamic class, working with a partner and helping each other out and building trust with each other through every exercise. By the time we had to try handstand on our own, each partner was celebrating the success of the other. 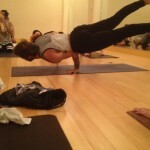 The benefits of inversions are enormous.. But wait, why is Patrick Beach the best? I have been practicing yoga for a long time but for me, inversions were not part of my practice or classes I took, until last year when I did my Yoga Teacher Training and realized all of the benefits of practicing them. After I started following Patrick and saw what he can do, I just wanted to do the same but didn’t feel confident enough to one day be able to do what he does. When he first came in to the shala Friday night, he laid against the wall, head down and started telling us a story that took few minutes with a story tied into what’s coming for the class and then he started the class. By the time the class started, I was so confident to be able to accomplish anything he would teach us. I was sold before we even started the first posture. He makes you, not only physical stronger, but also mentally stronger. He helps you build that confidence and mind-set throughout the whole weekend. You can tell he is very confident, does what he absolutely loves to do, works hard every day and then he “plays.” You can see the amazing things he can do in his YouTube channel or Instagram. And that is why, in my humble opinion, Patrick Beach is the best at what he does. 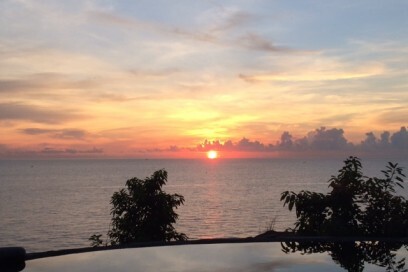 Patrick also made our top 5 yoga retreats and workshops to attend this 2016. If you liked this article, please share it with others and don’t forget to subscribe to our newsletter. And when you subscribe, we will send you 8 recipes we learned during our world trip, absolutely free!